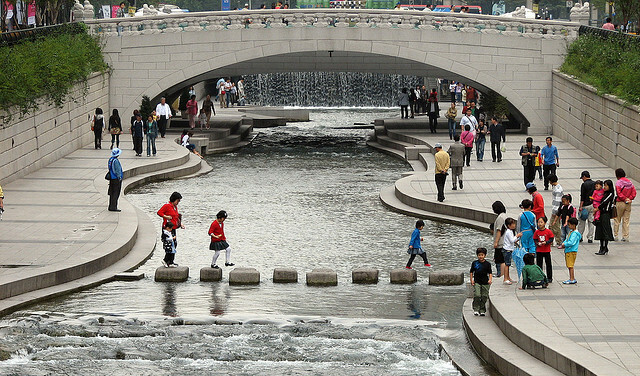 Cheonggyecheon in Seoul, South Korea is an international best practice for greenways that has also seen an increase in development and rents along the corridor and a decrease in air and noise pollution and traffic. Photo by Sarah Kim. If the twentieth century was known for building highways, the twenty-first century may be known for tearing them down. A new report jointly produced by the Institute for Transportation and Development Policy and EMBARQ, “The Life and Death of Urban Highways,” re-appraises the specific conditions under which it makes sense to build urban highways and when it makes sense to tear them down.